We’re pleased to be able to let you know that the Swainby Classic Car Show 2019 will take place on Sunday 25th August from 10:00am – 4:30pm. We’ll look forward to welcoming you on the day, and will make application forms etc available on this website over the coming months. We’re all keeping our fingers crossed for some fine weather on Sunday. We’ll be here whatever the weather, and are looking forward to seeing you on the day. To make the most of the car show, here are our top tips! Entry to the car show is £5 per person, but if you come along in your classic car, you’ll get in for free! Follow the directions that our volunteer parking attendants give you, they’ll show you the best spots to park on the field. Refreshments are available in our Village Hall, the tent at the show field, and in the two village pubs and cafe. Public toilets can be found a 2 minute walk from the show field on Emerson Close. If you need help or advice, please ask one of our volunteers at the show field entrances/exits. First aid will be available from our brilliant friends St John’s Ambulance on the show field. If you are bringing a dog, please keep it on a lead and clean up any mess. Visit our autojumble and other stalls. Remember that the car show is for charity not profit, so do have a go on our tombola, browse our bric-a-brac or buy a coffee and cake! This year the car show is proud to support two fantastic charities; Parkinson’s UK and Teeside Ability Support Centre. Parkinson’s UK works incredibly hard to raise money to find a cure for this debilitating condition, and to support those living with it. Our second charity is the Teeside Ability Support Centre, who provide care and life skills for the enablement of adults with differing abilities. TASC celebrate their Golden Jubilee this year, making our support extra special. Finally, we’ll also be making a donation to the Swainby Village Hall restoration fund. Our hall is a vital community asset, which also gives great support to the car show every year. Our autojumble is hugely popular with visitors and exhibitors on car show day. If you would like to run a stall this year, please complete our 2018 autojumble entry form. To enter your classic car into our show this year, please complete our 2018 vehicle entry form and return it to us. Please read the form carefully to ensure that all of your information is correct, and remember to enclose a stamped self addressed envelope to enable us to return your entry form. We’re pleased to announce that the date for this year’s show is the 26th August 2018, so save the date, and pray for good weather! We’ll be posting entry forms for both vehicles and autojumble very soon. Our 2017 show went brilliantly, and we saw a great range of vehicles on the day. Thankfully the sun shone for us, and plenty of ice creams were eaten! A huge thank you is due to everyone who contributed to our charities. We are delighted to be welcoming a very handsome guide dog Chris with his trainer Eileen on Sunday. 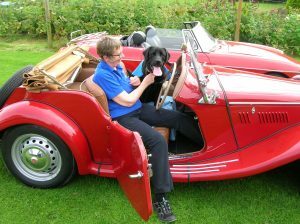 Here they are in a 1954 MGTF1500, which will be at Swainby classic car show tomorrow. Come and say hello to them on our showfield. With just over a week to go until our annual charity car show, preparations are well underway in Swainby. The sheep and local rabbits have left the field neatly nibbled, and our volunteers are getting ready to welcome you all. If you haven’t visited the car show before, here are a few tips for ensuring that you make the most of the day! Refreshments are available throughout the day from our friends in the Village Hall on the High Street, both village pubs, and from a stall on our showfield. There will be lots of delicious home made cakes available! Public toilets are located on Emerson Close. Our showfield may have uneven ground, so take care when walking. If you need help or advice, please ask one of our volunteers at the showfield entrances/exits. First aid will be available from our brilliant friends St John’s Ambulance on the showfield. If you are bringing a dog with you to our show, please keep them on a lead at all times, and clean up after them. You might want to pack wellies (just in case of rain!). A quick shout out to our autojumble folks; please don’t forget to include a stamped self-addressed envelope with your form, to enable us to return your entry form.